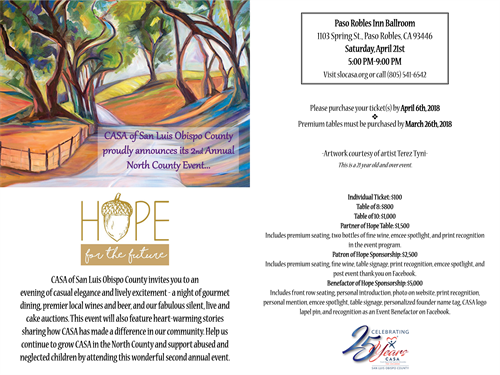 CASA of San Luis Obispo County proudly presents our 2nd Annual Hope for the Future event on Saturday, April 21st, 2018 at the beautiful Paso Robles Inn Ballroom. Join us for a night of gourmet dining, premier local beer and wine, exciting silent and live auctions, and our fabulously popular cake auction! Help CASA continue to grow in the North County and help support abused and neglected children in your community. This event will sell out quickly! Please visit: slocasa.org to purchase your tickets, today. Please visit slocasa.org for additional information about sponsorship table purchases.